Asparagus is a great addition to any meal no matter how you prepare it. 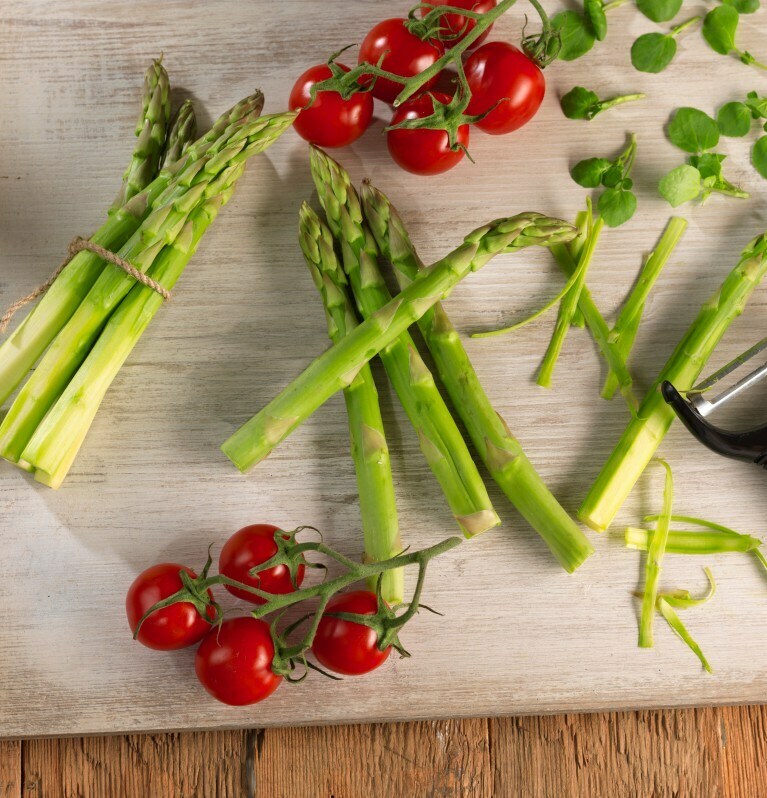 Cook asparagus to perfection with these tips. Check the weight and firmness of the asparagus to see how fresh it is. Fresher asparagus is heavier and should snap when you break the stem. If it looks like it is wilting, or feels light, it won’t be as tasty. Peeling thicker asparagus is an important part of preparation as it can speed up the cooking process and remove unwanted residue on the outer layer. Younger asparagus are called ‘sprue’ and don’t require any preparation besides being washed. Larger asparagus require more work. Firstly, cut off the woody end with a small sharp knife and then bend the asparagus by placing your fingers at either end. It should break and snap in half at the center. Using a regular vegetable peeler, peel along the sides of the stalk, avoiding the tip. You can also purchase a specially-made asparagus peeler that will make it easier. Roasting asparagus can take up to 15 minutes. Preheat your oven to 450°F and lay the asparagus out on an aluminum foil-lined baking sheet. The asparagus should be lined up next to one another to ensure even cooking. Sprinkle with some black pepper, parsley and chopped garlic cloves and brush with 1-2 tablespoons of olive oil before you put them in the oven. Keep an eye on them to ensure they don’t burn or wither. Once they are roasted, you can season them with some balsamic vinaigrette or lemon or get adventurous and wrap them with Prosciutto ham and top with shredded reduced fat Cheddar or Parmesan.